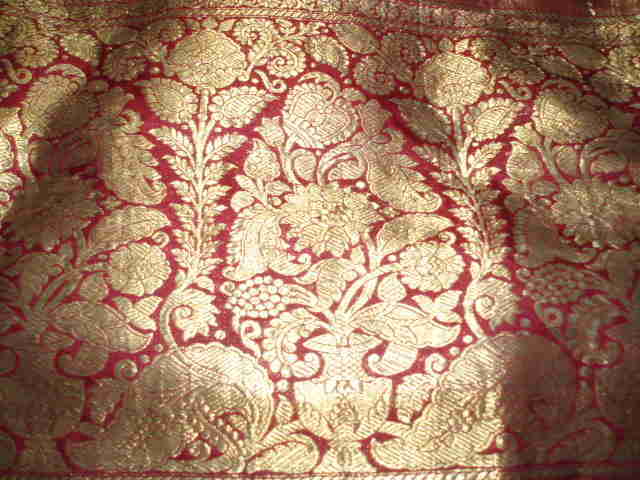 The Banarasi silk sarees are among the most expensive and popular sarees woven in Benaras. It is usually made of gold thread and therefore is very expensive. These sarees are popular as bridal wear and includes four varieties mainly: the kora, the katari, the sattir and the georgette. The history of banarasi saree dates back to mughal era.The designs and motifs are so very much inspired by the mughal time.The banaras brocade motifs are densely patterened and look three dimensional,which is quite unlike,the two dimensional pattern of deccan and south india.The traditional banarasi sarees are found in light colours that is it might be pale in comparision to other south indian sarees.Most of the Brocade designs are influenced by intricate intertwining floral and foliate motifs, kalga and bel. 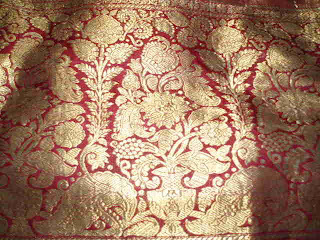 The signature design of Banarasi Brocade is a narrow fringe like pattern, called Jhhalar, found along the inner and outer border. A Kanjeevaram saree is a must have in every Indian woman’s closet and what makes it so desirable is the colour of Indian heritage which is so well displayed in these sarees.The name Kanjeevaram saree is placed after the name of a small temple village in Tamilnadu. The vibrant shades of these sarees not only reflect the traditional favourite hue but also the new choices.These sarees are also known for their durability. 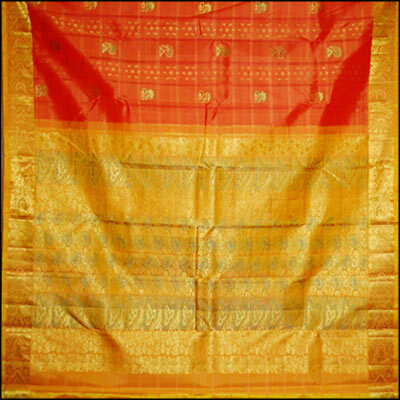 The silk base is thicker than any other silk saree and this thickness makes it the most expensive silk sarees in India. It is believed that “The heavier is the silk, the better is the quality”. 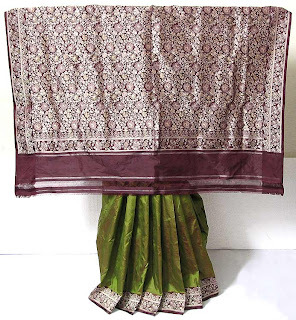 The most common motifs found in Kanjeevaram sarees are Peacock and parrot. traditional.In an authentic kanjeevaram saree the pallu, the border and the body of the saree is woven separately and then interlocked together.These sarees are characterized by gold dipped silver thread that is woven on the premium quality. Craftsmen of Bishanpur in Murshidabar dist. of West bengal produce this one of the most delicate and royal kind of saree.Unlike from any other silk saree in India baluchari saree is famous for its soft colour combination,we don't see a contrast combination in baluchari sarees. Baluchari saree is five yards saree and is 42” wide in bright colors like flame red, purple and occasionally in deep blue. These sarees are made of silk and woven on looms. These are about 200 year old. The sarees look similar to Banarasi sarees. There is only one difference between the two sarees, Baluchari sarees use only silk threads and Banarasi sarees do use zari threads. 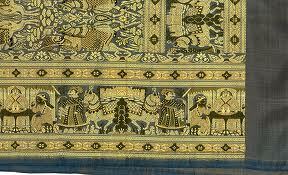 The borders of the sarees depict stories from Mahabharata and Ramayana. The field of the saree is covered with small butis and a beautiful floral design runs across the edges. Kornad sarees are also called temple saree as it is mainly woven for temple dities in temple.The traditional temple wear saree is also called mubbhagam that has two different borders and field of equal width.More commonly these sarees are available in traditional colors like earth shades of browns, grays and off-whites buy now days brighter shades are also available for the North Indian buyers. Great collection of Indian Silk Sarees . i was looking for such a collection for a long time. Finally got it. Nice information of silk designer saree. Nice blog content. This is a lovely post. Exquisite silks saris and beautiful words!! 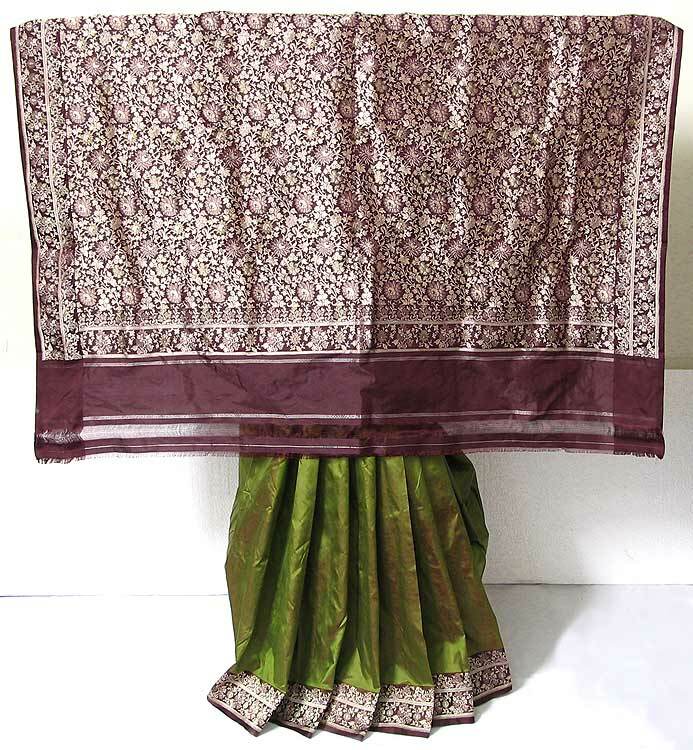 In general a sari has always been the epitome of elegance and grace it's more for Banaras and Kanjeevaram silk sarees (http://goo.gl/BGTRgs). Apart from the weaving style, mixing of the yarn both are always perfect to carry for any occasions. Really appreciative ! Thanks for sharing such a nice information with us about diffferent types of Indian silk sarees but I have one question I hope you would answer, which is the best among of them either Banarasi silk, Kanjeevaram Silk, Baluchari saree and plz mention the price range of these different variety of silk sarees. The silk saree collection you have shared is really superb I have no words how beautiful they are. Thanks for sharing here with us. A saree is the most traditional outfit for Indian women.Silk, the queen of textiles dominates the textile industry with its lustre, sensuousness and glamour. In India there is a wide variety of Silk Sarees available in the market. Some of the most popular silk sarees are Banarasi silk, Kanchipuram silk, chiffon silk, crepe silk, Tussar silk, kota silk. Each of these silk sarees varieties are unique in its own way and has a beautiful tradition surrounding them. Good post! I found amazing products on your blog. If any one is looking for Indian Clothing Online Australia store then you can click on the link given in this line. Wow the post you have shared here is very useful, feeling good after reading your blog. Got many things here to know about. Keep updating more useful blogs with us. Nice Blog about the Different varieties of Sarees. A great post and an informative blog on Silk sarees online with excellent collections. Nice collection of silk sarees. Thanks for Sharing..
Like you all about saree info, In India Banarasi Sarees is first choice of women. She is like to wear saree in Festival. I like to read this blog. 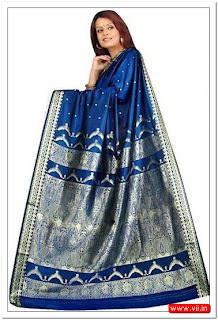 So many women like to buy silk saree online in USA. Get more happy with an Indian Silk Sarees during festival time! Amazing article . art silk sarees looks really classy and fashionable ! Lovely article! Do check out oure collection of Kanchipuram Silk Sarees at Kuberan Silks. South Indian silk sarees are looking great for festival days! Check out the latest collections and get your favorite pure silk sarees today! TheEthnicWear is providing custom stitching services for Saree Blouse, Bollywood Salwar Kameez, Lehenga Choli, Anarkali Suit & Bollywood Sarees. Our company is delivering products from India and a lot of customers are from USA, UK, Canada, Australia, Germany, France, Dubai, Malaysia, New Zealand, Mauritius, Netherlands, Saudi Arabia, South Africa, Singapore & Worldwide. We are also offering Cash on Delivery(COD) service in India. I truly like you're composing style, incredible data of sarees. Kanjeevaram silk saree are famous across the world. thanks for sharing this post. Buy Exclusive Kanchipuram silk pattu sarees online. Samyakk.com offers great discount on Kancheepuram, kanchi pattu sarees collections with free Worldwide Shipping. Wow it's really great is it possible to do in .Thanks for sharing great post. saree manufacutre in surat. One of best silk saree manufacturers i had experience with was Sri Sarvalakshmi Silk Saree Shop because this shop has sarees that are most elegant, beautiful and hand woven. They have wide range of sarees starting from lower to higher costs as per customer’s request. They also customize sarees and make wedding silk sarees with designs as per customer/s request for wedding functions or any other functions at your budget. Their collections are awesome such as pure Kanchi pattu, Wedding sarees, Fancy sarees, Soft silk sarees and many more. Grab your favourite saree by visiting Sri Sarvalakshmi Silk Sarees Manufacturer Wholesale Supplier kanchipuram and hear your relatives or friends asking. Where did you buy this saree ?? leaving a big smile on your face. Dive into Wholesale Kanchipuram Pattu Pure Silk Sarees Manufacturers Supplier Online Saree Shopping india for more collections. Buy latest Indian sarees online at best price from Prakash Silks! Buy Luxury Silk Sarees from Prakash Silks at best price range in India!